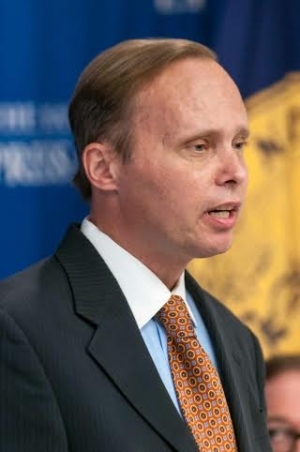 Bill Piper, director, Drug Policy Alliance office of national affairs speaks at a National Press Club Newsmaker, July 24, 2014. Legalization of marijuana is an issue that has focused the attention of proponents on the failure of the war on drugs, while opponents say that is a misdirection to hide how legalization is really about the rise of a massive new industry being modeled after one of the most destructive legal drugs used by Americans today -- alcohol. That was the topic of a spirited discussion today at a Newsmaker press conference, “Interpreting smoke signals from the marijuana skirmish line,” held at the National Press Club. Those minorities arrested, he says, are facing essentially a new Jim Crow system because they can be discriminated against for years because of their arrest for marijuana possession. Opposing his viewpoint, Kevin Sabet, the director of the Drug Policy Institute at the University of Florida, a policy advisor to the Obama administration and cofounder, with Patrick Kennedy, of Project Smart Approaches to Marijuana, said that Piper made the whole war on drugs issue related to legalizing marijuana sound too cut and dried.